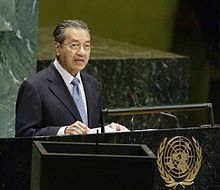 Tun Mahathir bin Mohamad (Jawi: محضير بن محمد‎; IPA: [maˈhaðɪr bɪn moˈhamad]; born 10 July 1925), known informally as Dr. M, is a Malaysian physician and politician who is the current Prime Minister of Malaysia. He is also the author of numerous books, the first of which was The Malay Dilemma. He previously served as prime minister from 1981 until his retirement in 2003, by which time he was the world's longest-serving elected leader. He is the chairman of the Pakatan Harapan coalition, as well as a member of the Parliament of Malaysia for the Langkawi constituency in the state of Kedah. Mahathir's political career has spanned more than 70 years starting with his participation during the Malayan Union in protests against non-Malays gaining Malaysian citizenship; he formed his own party, the Malaysian United Indigenous Party (PPBM), in 2016. Born and raised in Alor Setar, Kedah, Mahathir excelled at school and became a medical doctor. He became active in United Malays National Organisation (UMNO) before entering Parliament in 1964. He served one term before losing his seat, subsequently falling out with Prime Minister Tunku Abdul Rahman and being expelled from UMNO. When Abdul Rahman resigned, Mahathir re-entered UMNO and Parliament, and was promoted to the Cabinet. By 1977, he had risen to deputy prime minister, and in 1981 was sworn in as prime minister after the resignation of his predecessor, Hussein Onn. Mahathir is now the oldest currently serving state leader in the world (aged 7004342510000000000♠93 years, 283 days). As proposed in the original plan of Pakatan Harapan, Wan Azizah ran as his deputy, and therefore became the first female Deputy Prime Minister in Malaysia. Following his appointment as Prime Minister, Mahathir promised to "restore the rule of law", and would make elaborate and transparent investigations on the 1Malaysia Development Berhad scandal possibly perpetrated by the ex-Prime Minister, as Mahathir told the press that if Najib has done something wrong, he would face the consequences.